Please join us for Havdalah followed by concert of original sacred music from the Galilee by our special guests Rabbi Or and Feliza Zohar. 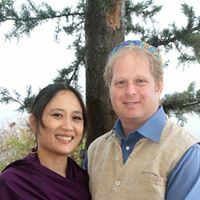 Rabbi Or and Feliza will share their melodies along with stories about the context of how the songs are being used in Israel and how they came to be composed. They will speak on the multicultural reality and reform awakening in Israel. Their music is a reflection of this growth and provides a way to understand their lives in Northern Israel.